Mary MacADNski: These are Common Grackles. If you get tropical grackles they might be a bit different but similar. These look like Grackles...one of the few things I miss about living in the Phoenix area is the sound of the Grackles! 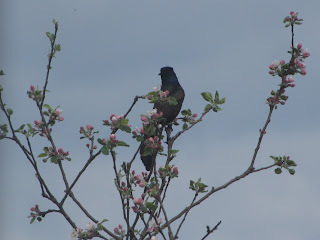 Mary MacADNski: They are grackles and a sure sign of spring. Are these the same as our Crows, Mary? Mary MacADNski: The Common Grackle, Lisl. Some have identified it correctly so I think it might be in England. Mary MacADNski: I have kept a checklist for over 40 years but did not join a club. Mary MacADNski: They are; a spring bird worth showing. They look good in this tree without leaves. Mary MacADNski: We have no leaves yet. Usually a month from now or so, on our Mother's Day, the second Sunday in May, they are here. we are progressing well into an early spring though so I am in full gardening mode. A lovely picture of them Mary. 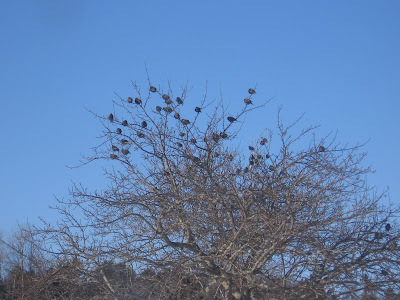 Mary MacADNski: Grackles in the first two shots. Aren't they wonderful. Each with its own bit of branch. I wish I had 4 hours to spare to asit and listen to the video right through. Mary MacADNski: Just leave it on in it's own window or tab at anytime while being elsewhere. I have had it on since I got on the computer an hour ago. Mary MacADNski: You said it! I heartfully agree.